Greenpeace today slammed Microsoft and Nintendo for being too slow in phasing out toxic material from their game consoles. 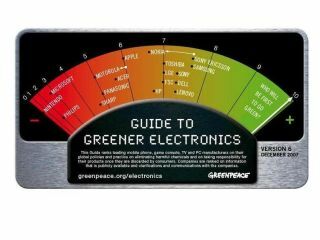 TV makers Philips and Sharp also need to shape up their policies on taking back and recycling outdated products, Greenpeace said in the latest version of The Greener Electronics Guide. These four companies are all at the bottom of Greenpeace's environmental rankings, with Nintendo becoming the first company to score zero out of a possible 10 points. The most environmentally friendly companies were Sony Ericsson and Samsung, each scoring 7.7 points. The previous leader, Nokia, was criticised for not living up to its promises to take back used hardware, as was Motorola. Apple, previously bottom of the list, managed to lift its ranking to 11 out of the total 18 in today's list. This was due to Steve Jobs' pledge to remove PVCs and brominated flame retardants from all Apple products by 2008. Greenpeace judges companies on their timelines for eliminating PVCs and fire-preventing chemicals from their products. These materials can be dangerous when released into the environment. The report also assesses companies' ability to collect hardware that has reached the end of its life cycle. Next year Greenpeace will add energy efficiency to its criteria, said Iza Kruszweska, toxics campaigner at Greenpeace International. "We didn't want to do everything at once," Kruszweska said. "It started off with leading mobile phone and computer companies' handling of hazardous chemicals and waste. "The addition of television and game consoles was recognition of their growing importance in consumer electronics, especially as more people cast off old TVs for digital receivers," she said. Shipment of game consoles grew nearly 15 per cent last year to 62.7 million units world wide, Greenpeace said. Microsoft was judged on its Zune digital music player and Xbox game console. It lost points for not pledging to eliminate toxic chemicals until 2011, and for having no voluntary takeback program. Nintendo provided no information to consumers on the substances it uses or future elimination of hazardous materials, Greenpeace said. "Companies shouldn't be under any illusions that we won't check up on their claims of green greatness," Kruszewska added.